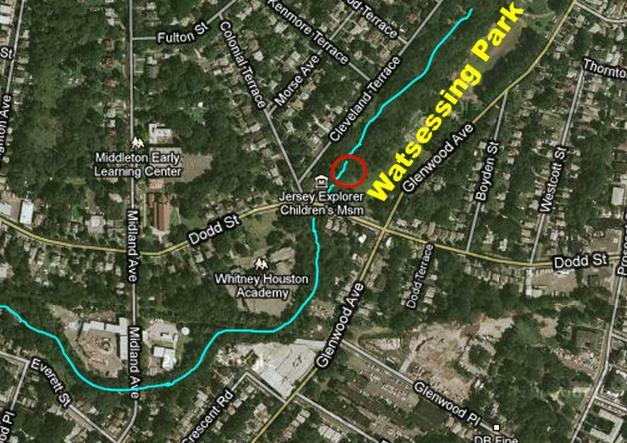 I am surprised that many East Orange residents don't know the location of Watsessing Park, but here is a map to guide you to the site of the East Orange Tea Party on the bank of the Second River that runs through the park. We met at the spot pointed out in the red circle on the map. A lot of the confusion about the location of the park may be caused by the fact that it is NOT a municipal park, but is controlled by Essex County, and the main part of the park is in Bloomfield, so that is the "official" address. If you search Google Maps for "Watsessing Park, East Orange, NJ" it sends you instead to "Watsessing Park, Bloomfield, NJ...NEAR East Orange." You can't see the Second River on any satellite maps because of the trees lining the banks. I have marked it in blue on the map. If you follow Glenwood Avenue towards Bloomfield, you will drive right past the park. You can park your car along the sides of Glenwood Avenue, and it is an easy walk into the park. We met just beneath (and in view of) The Franklin Branch of the East Orange Library, at 165 Dodd Street. That is also the home of the Jersey Explorer's Children's Museum. It is also across from Whitney Houston Academy on Dodd Street, which old timers will better remember as Franklin School.